Hardwood or Laminate, Which Do You Choose? If you are having trouble deciding whether you want to go with real wood flooring or laminate flooring, you have come to the right place. Today we are going to compare and contrast each flooring type so that you will be able to come to a decision that will best suit your flooring needs. How long will you plan to live in your current home? Starting with the first question listed, if you know in advance that you will be moving into a new home in the future, you will need to take this into consideration. The expense associated with buying and installing real wood flooring is more expensive than that of laminate flooring, however homes on the market with hardwood flooring and highly desirable. This will make moving a much more lucrative option in the long run. Moving on to question two, funding is also a rather huge factor when it comes to making your decision. Laminate will definitely be the more economical choice. If you have room for more in the budget then by all means go with real hardwood if it fancies you. How much foot traffic do you have going through your home on a daily basis? As for question three, if you have any children, pets or just plain old house guests, you will be good with either. Both laminate and real wood flooring are incredibly durable. Make sure you go with a higher quality of either for high traffic homes though, if not wear will begin to show rather quickly. This is true for any type of flooring. Are you planning on selling your home for a return on the initial investment? Question four can be a harder to consider than most if you are planning to sell the home at some point. Real hardwood floors do sell better on the market, but if the home isn’t necessarily top quality itself, a laminate may be the best option in this case. In this market many people are getting surprising results by just updating there flooring rather than planning to get the highest return on there investment. What type of style does your home’s design aesthetic lean toward? The final question is simple. This all depends on the personal style and value that you have put into your home in its current state. 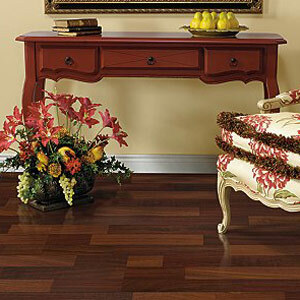 If you have spent thousands on décor and furnishings then why would you put a laminate floor down? On the flipside, if your home is less expensively decorated and designed a hardwood floor maybe over kill. In this case it is really just a matter of personal tastes. Answering all of these questions will surely solve you flooring conundrum. There are two distinct differences when it comparing real wood and laminate flooring. And this is simply, one is real wood and one is a plastic that has been made to look like real wood. It is as simple as that.